Los Angeles County Sheriff’s Department’s Missing Persons Unit detectives are seeking the public’s assistance in locating Joe Garza. 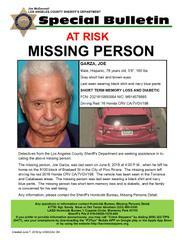 He is a 76 year-old male Hispanic who was last seen driving away from his home on the 8100 block of Bradwell Street in the city of Pico Rivera, Wednesday, June 6, 2018, at 4:00 p.m. 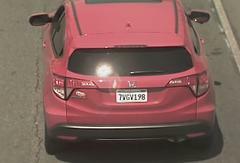 The vehicle is a red 2016 Honda Civic CRV license CA/7VGV198. It has been seen in Torrance and Calabasas areas. 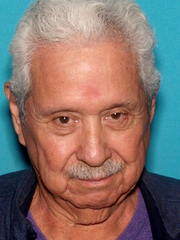 Mr. Garza is described as 5’06 tall, 160 lbs., short grey hair and brown eyes. He was last seen wearing a black shirt and navy blue pants. He suffers from short term memory loss and is diabetic. Mr. Garza's family is very concerned and asking for the public’s assistance in located him.